Thank you for supporting my blog and homeschool! See my full Disclosure for more information. I don't know about you, but as a homeschool mom to more than one child, I need to be mindful of that fact as I look at homeschool curriculum. I had the privilege of receiving free access to the Family Math Package, online from A+ Interactive Math to review. 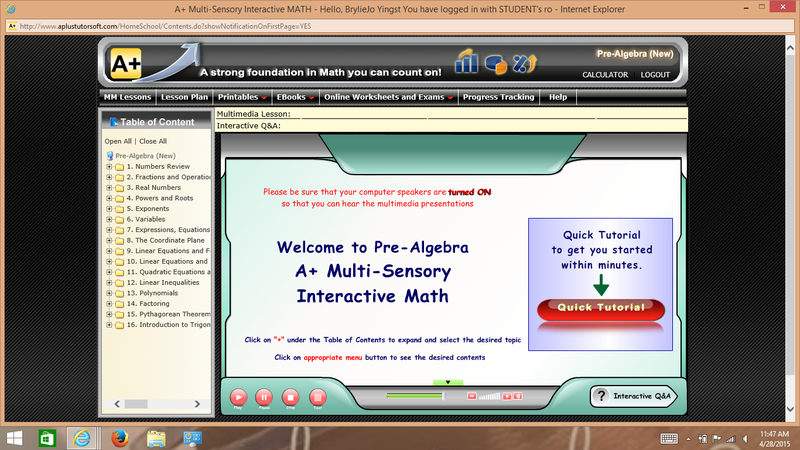 This online math curriculum is wonderful! The Family Math Package can accommodate up to ten (10) kids......EACH AT THEIR OWN LEVEL! I know!!! It really does sound too good to be true! This multi-sensory homeschool math program is for your child no matter what level they are in. What makes it even better, is that you can move them back and forth between different levels as their math skills deem necessary! I know that some people balk at online courses and feel that the hands on approach of physical books are superior. You must try the free one-month family package and see first hand the benefits of a program that grows with you! The picture above is the screen that you will see when you log in. There is a quick tutorial button. Make sure to watch it....it was very helpful. What I want you to notice are the tabs that run along the top of the screen. What you see when you glance across are: MM Lessons, Lesson Plan, Printables, EBooks, Online Worksheets and Exams, Progress Tracking, and Help. I love that each worksheet, and Exam can either be taken online or printed off for the student. When they are taken online you get the added benefit of AUTOMATIC GRADING!!! Wow!! I love that part!! Not only are you able to have the worksheets and exams automatically graded, but then it stores the grades in the "Progress Tracking" tab like the picture below. LOVE! LOVE! LOVE! Although the lesson videos are read aloud with important facts highlighted in the lesson, I love that there is a Curriculum Book under the "EBook" tab. We found that it was a very beneficial resource for us. 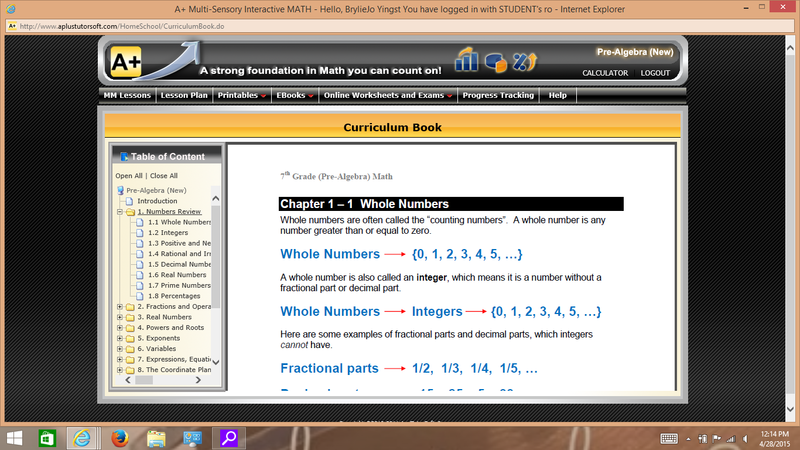 The picture below has the Pre-Algebra Curriculum Book opened to the first lesson. It is a wonderful addition to the video lesson. At the end of each video lesson there is a Question & Answer tab that tests the comprehension of that lesson. When the student gets a question wrong it will take them back to the correct answer in the lesson and remind them what the correct answer is. I was only able to use this product with one student, but know how much this would benefit some of my friends with more children than I have. We used it everyday for several weeks and were able to move back and forth between math levels as needed. We loved that fact! 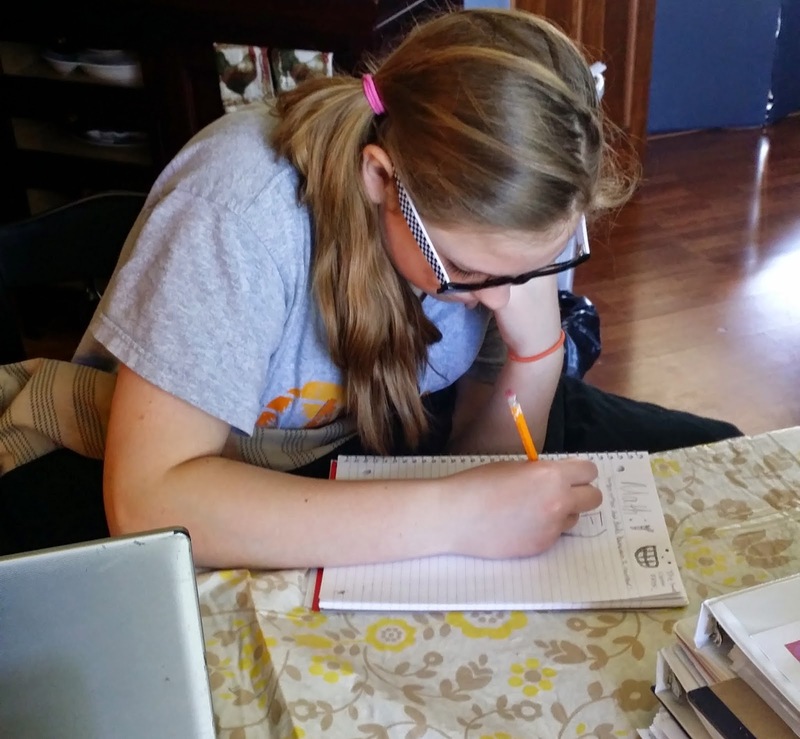 She has struggled in math and so being able to look through the grade levels of math and find exactly what she needed to strengthen some of her math skills was a great thing for this homeschool mom! We chose to use the online worksheet and exam method of quizzing and testing skills. I like that choice because then they are automatically graded and stored in the progress tracking section of the program. 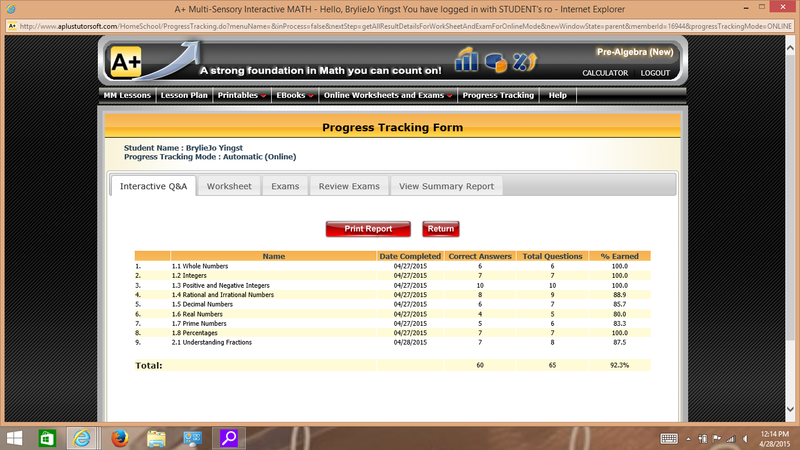 We are able to see what her grades are on the interactive portion of the video lessons, the worksheets and the exams. What is not to love about this product?! I found it very helpful with my student. My daughter would prefer that math was not a subject in school at all, but she seemed to enjoy using this product, and her grades showed it! This product is top notch and will be a wonderful benefit to any homeschool family, especially those with multiple children!